Non Hazardous - Non Toxic - Non Caustic - PH Neutral - No Fumes - No Skin Burns - Non Flammable - Non Combustible - No ventilation – Phew what a mouthful. It just means it’s SAFE and EASY to USE ! Why, I can clearly hear you saying, is a gardening website getting involved with paint stripper and suchlike ? Well it’s really, really simple. We hate waste – and it’s so, so easy to waste the world around us ! So I don’t care if you think our paint stripper is out of place, ‘cos now I’m adding some other totally non toxic, totally safe water based stuff – although it has nothing to do with gardening. New stuff that not only is totally safe to use, but also protects your blood pressure ( non medically proven) when removing that most heinous, most vicious and most reluctant product of the 70’s. 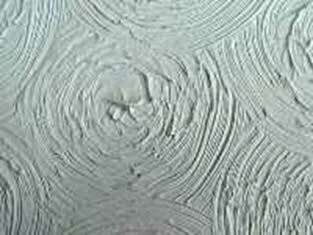 We once removed a ceiling coated in Artex, almost literally. After every our knuckle was ripped, every expletive expleted, and every pet in hiding we decided to chip it away. Well it partially worked, the plaster came away but the Artex was still stuck to it. Was sure at the time that all those rough ridges were really smug smiles ! So wish we had known about this X TEX stuff back then. 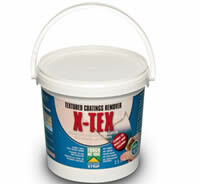 ‘Cos even if we had known about the asbestos this Artex remover will easily strip without chips or dust. Simply, if you want to remove Artex or similar from ceilings and walls safely and completely without damaging the here and now, or the future then use this X TEX. We do ask for a contribution of £6.95 towards postage though. Sorry !